It was my childhood dream to study in London and become a lawyer. I first came to London when I was 11 years old and it was a life-changing experience. I was amazed by the culture of the city, its environment and people. England’s education system is one of the most prestigious and respected in the world, so I thought attending university here would build a strong foundation for my future career. When I attended an education fair in my hometown five years ago, INTO City attracted my attention instantly. It had a reputation as a respectable educational institution which sets very high standards for admission, therefore I expected it would give me the necessary knowledge and skills to get into City, University of London later on. 2. Tell us about your experience as an international student. I came to the UK completely alone when I was just 18 years old. It was scary and lonely in the beginning, as I knew nobody here. However, my first day at INTO City changed everything. All the staff were very friendly and I immediately met lots of nice people from all over the world who were in the same position as me. London is an amazing place that brings together people from many different cultures, so you never feel like a foreigner here. Not only have I improved my English language skills, but I have also learnt the real taste of independence. 3. What was life at INTO/City, University of London like? Studying at INTO City was great preparation for university life, as the teaching style and assessments were very similar to what I later experienced at City. INTO City is a school of life - it will not only give you the necessary knowledge and skills for higher education, but it will also teach you how to be independent and motivated. Life at City, University of London was great as I got to join the Law Society and also write for the City Legal Journal for several years, which was an invaluable experience. 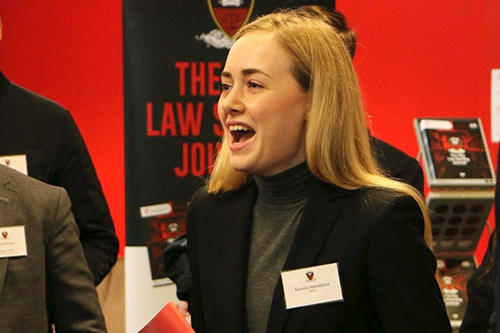 Being a member of the Law Society was probably one of the best decisions that I made during my time at university, as I had access to interesting careers events and had the opportunity to meet like-minded people who also wanted to become solicitors or barristers. My second year at university was very tough, as I not only had to prepare for exams but was also sending out applications for vacation schemes and training contracts. This period was stressful for me, as I entered an adult world and learned about rejection and disappointment. However, it is better to learn about these things earlier, rather than later on. My goal was to get a training contract before graduation, and I did. Now I am getting closer and closer every day to becoming a solicitor. All this hard work, studying and preparation has paid off, as I will get to do what I always wanted to do thanks to INTO City and City, University of London. 4. What advice can you give to students who are considering studying at INTO/City, University of London? Start working and studying from day one, as you need to build a strong foundation for your own future and competition in the jobs market is fierce. First year grades do count. This is the first thing that your future employer will see on the application form when you apply for an internship or vacation scheme. Make friends and establish contacts while you are at INTO City – these people might be studying at the same university with you later on, and everyone needs support. Embrace all the opportunities that present themselves – attend career fairs, education fairs, workshops, master classes etc., as you never know who you are going to meet there or what you are going to learn. Set your goals high and never let anyone undermine your abilities. Be proactive and participate in societies – this will look great on your CV later on. Treat INTO City as if you were at university already, because this will make your life easier later. Don’t be afraid to put yourself out there; London is all about embracing talent, so it doesn’t matter where you come from. INTO University Partnerships is an independent organization focused on expanding higher education opportunities for students worldwide.